All transactions are safe and secure with a reliable history in online purchasing behind each of our associates. 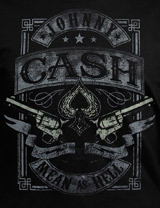 Buy the Johnny Cash Mean as Hell t-shirt to own Johnny Cash clothing and merchandise. One of our bestselling music tees, the Johnny Cash Mean as Hell shirt is a tribute to the legend, the Man in Black, who was also a close friend of Elvis Presley. The rich black tee features Cash with two pistols. This T is the perfect gift for any Cash fan with an attitude. Enjoy its comfort as you listen to your Johnny Cash greatest hits cd albums. In addition to the Johnny Cash Mean as Hell tee above, browse the Johnny Cash Clothing Gallery for more apparel like men's and women's clothes, kids shirts or hoodies.